Andre Lanskoy was a painter and a printmaker. 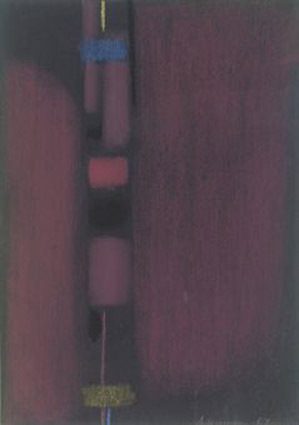 He is associated with the School of Paris and Tachisme an abstract painting movement that began during the 1940s. After 1905 the family moved to St. Petersburg, the capital in 1909. In 1918 he moved to Kiev where he painted his first paintings. During the Russian Civil War he fought in the Tsarist White Army. After an injury he moved to Constantinople and in 1921, he went to Paris. In Paris, Lanskoy started to paint: Literally in the first night I started to paint and I haven't stopped since. In Paris he met Serge Poliakoff and later he met Nicolas de Staël there. He spent a lot of time at museums and was influenced by James Ensor's and Vincent van Gogh's use of color. 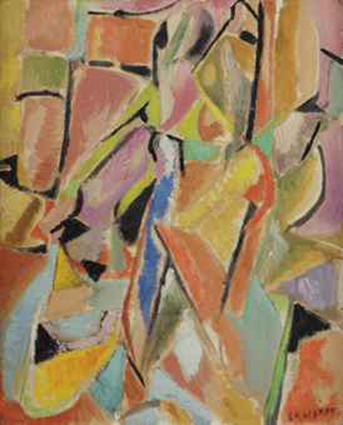 In 1923 he participated in his first group exhibitions of Russian painters at the La Licorne Gallery in Paris. Wilhelm Uhde discovered Lanskoy's paintings at the Salon d'Automne in 1924 and he began to collect Lanskoy paintings in the years that followed. In 1925 he had a solo exhibition and his works were acquired by museums and important private collectors. 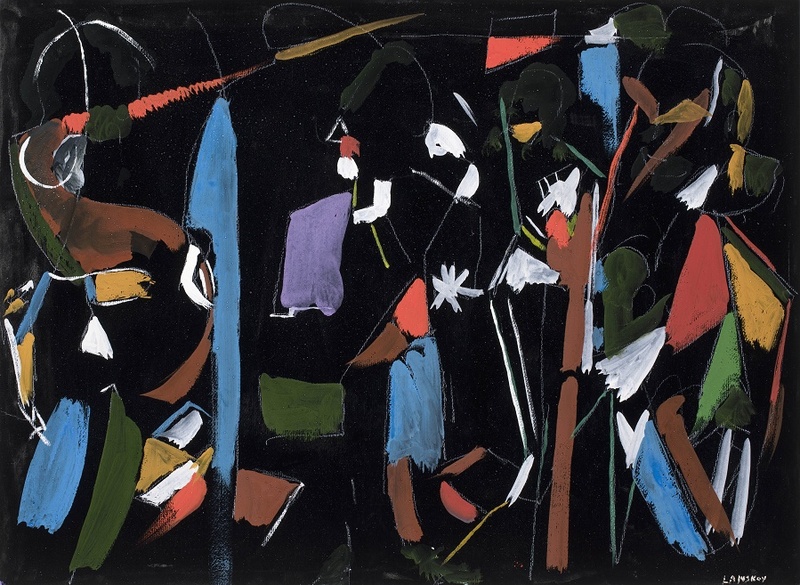 After 1937 his paintings began a transition towards abstraction and he studied both Paul Klee and Wassily Kandinsky. After 1942 he painted only abstract works. The interaction of form and color, became the major theme running through his oeuvre: Even though every brushstroke represents for itself a transformed reality, it receives its true meaning in the context of surrounding shades of color. In 1944 Lanskoy exhibited at the Jeanne Bucher Gallery in Paris where he met Nicolas de Staël. 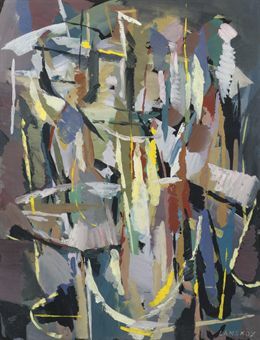 In 1948 he showed at the Louis Carré Gallery and in 1951 at the Galerie Jacques Dubourg. 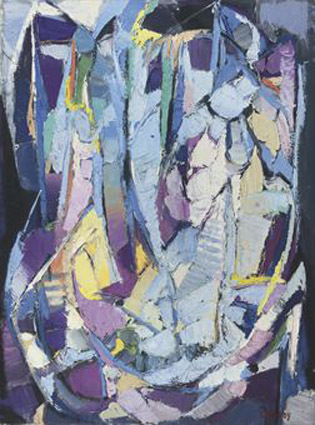 The Tooth and Sons Gallery showed his work in 1953 and The Loeb Gallery in New York City followed in 1959. In 1962 he began to work on a large project of original prints and collages to accompany Nikolai Gogol's novel Diary of a Madman. He worked for fourteen years until his death on this project resulting in 150 collages and 80 lithographs. In 1966 he had an exhibition at the Museé Galliéra, Paris. The Neue Galerie in Zürich held an exhibition in 1969. In 1976 Lanskoy died on the 24th of August in Paris. The Aras Gallery collected the extensive Diary of a Madman series of prints and staged a major posthumous exhibition in 1989.